Working with Pamela Calvert Interiors, these owners completely transformed their majestic hideaway-in-the-woods. 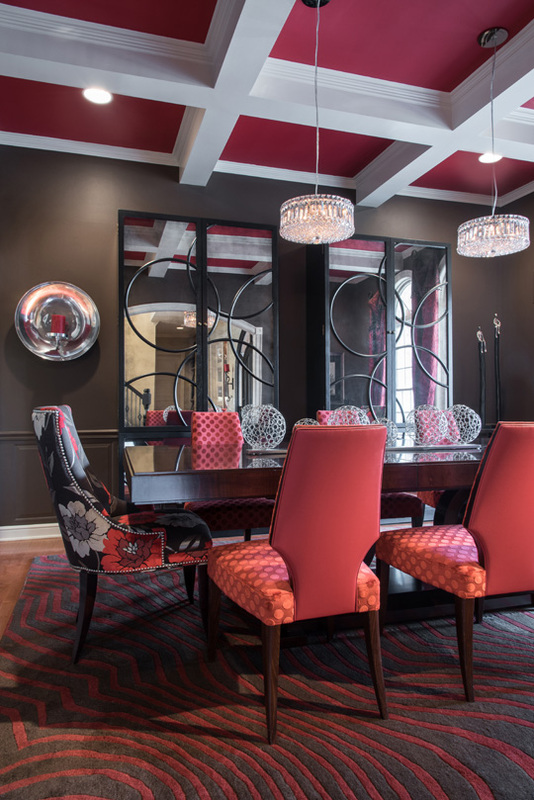 Responding to her client’s affinity for geometric shapes and “aggressive” color, designer Pamela Calvert suggested a rich palette of sable brown and “Show Stopper” red for the formal dining room. Unique geometric display shelving establishes a focal point for the master bedroom. Set on a creamy frisé area rug, the Century chaise’s upholstery is accented in silver, and two-toned trim work adds interest to the tray ceiling. 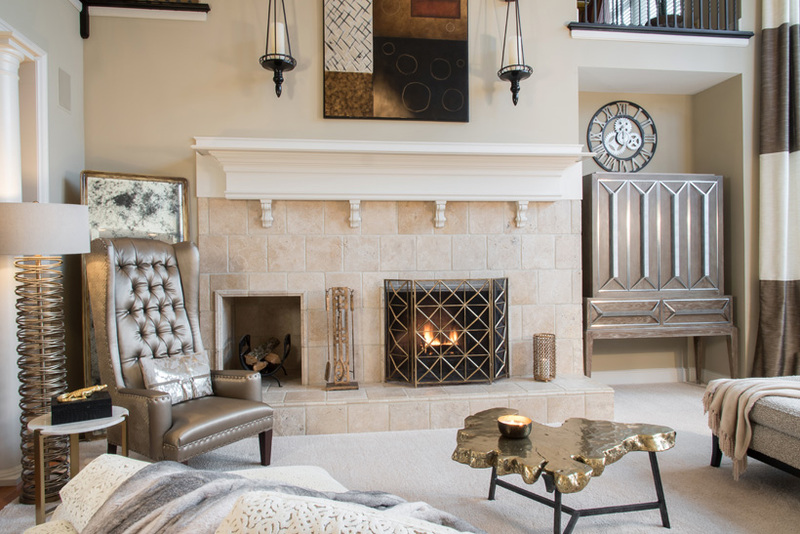 “Serene and elegant” in cream, beige and gold, the great room showcases a huge curved Precedent sectional in textured cut velvet; an organic precast coffee table finished in metallic gold; and dramatic 20-foot silk drapes custom fabricated by Material Girl. Murphy, the family’s beloved labradoodle, relaxes in the woodland-themed hearth room. A striking mix of materials, the kitchen blends Chocolate Bordeaux granite with brushed stainless steel, natural stone and glass. Beck/Allen custom-designed the distinctive cabinetry and flyover, and swivel Century bar stools in red leather lend a dash of color to the bi-level work island. Original to the home, the stone fireplace and wood-beamed ceiling set the tone for the open hearth room and breakfast area. For a touch of glamor, a glass leaf-designed chandelier from Global Views is suspended above the country-chic dining ensemble. A John-Richard TV cabinet fills the alcove flanking the great room’s massive, stone-front fireplace. To balance the alcove, Calvert created a striking vignette with a spiral-based floor lamp and high-back chair, set against an antiqued mirror that reflects the chair’s patterned velvet back. The Cooks’ youngest daughter was allowed to choose the décor for her bedroom suite, which she based on the fresh tropical hues of the Hawaiian quilt. The feathery canopy, window treatments and various other appointments were custom-made by Material Girl. Carved from eight gloriously wooded acres in western St. Charles County, this scenic haven has been home to Jim and Amy Cook’s family for 18 years. The custom-built, Old World-styled residence complements its natural surroundings and features an architecturally consistent detached garage, spacious pool complex and a fenced play area and sports court. At 7,500 square feet, the expansive 1.5-story has been ideal for the couple’s growing family and includes generous office space, from which the owners operate their numerous business holdings. Seven years ago, the Cooks were planning to remodel their finished lower level — a choice that ultimately led to a complete home makeover. A longtime reader of St. Louis Homes + Lifestyles, Amy was attracted by an article on Pamela Calvert, ASID. Respected throughout the local industry for nearly three decades, the designer quickly recognized her client’s affinity for “aggressive” color, geometrics and circles, and the two clicked instantly, developing a remarkable creative synergy. Delighted by the outcome of their new lower level, the owners decided to update the entire home, transitioning from its original French Country theme to a “richer, more dramatic” look. Although no structural changes were necessary, a few color modifications were made to the exterior; the interior’s light oak woodwork was stained to match the existing cinnamon-toned maple flooring; and the master plan called for all-new furnishings, as well. “We wanted to make a power statement, and the décor evolved over time,” Pamela explains. Starting in the formal dining room, the designer presented several color stories, and Amy chose a warm chocolate-and-red combination. The walls and wainscoting were painted a deep sable brown, and “Show Stopper” red was applied to the coffer panels, emphasizing the 10-foot ceiling. Centering the space is a sphere pedestal dining table from Selva’s “Vendome” collection, set on a handmade, custom Surya rug. The table is flanked by Selva chairs, leather-backed and upholstered in a vibrant, circular-patterned Romo fabric. To soften the effect, the host and hostess chairs are covered in a Romo floral. Running her fingers along the hand-selected nail heads, Pamela adds, “Everything I do is custom,” and her attention to the smallest details is evident throughout the home. Next on the owners’ to-do list was the master bedroom, where the carpeting was replaced with chocolate-hued cork flooring. Sable brown walls create a rich background for the creamy, two-toned tray ceiling, stunning geometric display shelving and a custom Precedent bed, upholstered in ivory linen. Hickory White chests, topped by unique bead-strand lamps, serve as nightstands, and a Century chaise and Precedent klismos chair, both luscious in chocolate and silver, provide comfortable seating. Modernizing the kitchen was another priority for the Cooks, and the open family activity spaces — kitchen, breakfast area and hearth room — were treated as a single project. Sleek and sophisticated, the kitchen is a harmonious mix of materials. 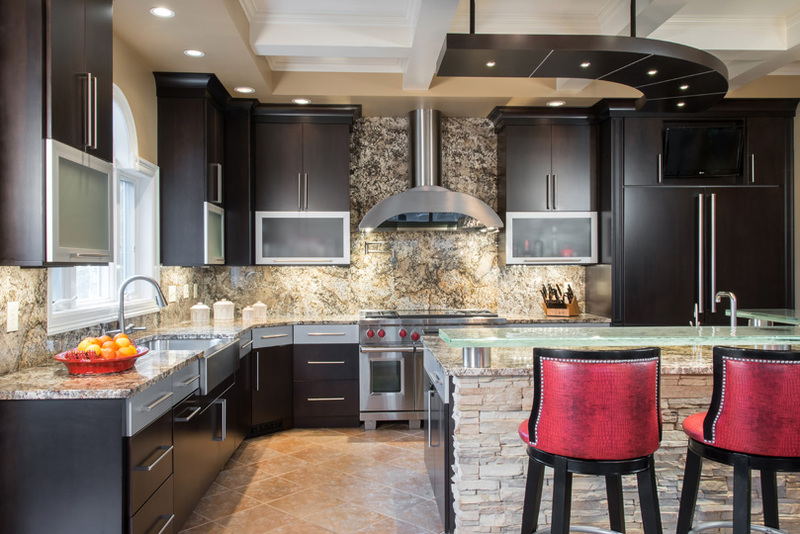 For visual simplicity, Pamela blanketed the center island, counter surfaces and backsplashes in Chocolate Bordeaux granite. Custom-crafted by Beck/Allen, the cabinetry displays canopy-style frosted glass doors on the upper cabinets and a continuous band of brushed stainless steel on the top base drawers, linking the cabinetry with the stainless Elkay apron-front sink, high-end appliances and contemporary range hood. The bi-level island is literally a work of art, with natural stone covering the base, cylindrical stainless supports and an overhang crafted from two thick slabs of textured glass, connected by a circular piece of granite. Adding a dramatic touch, the island area is lit by a curvilinear flyover and fused glass pendant lights. Open to the kitchen, the hearth room’s original beamed ceiling and stone fireplace were consistent with the relaxed, woodland look the duo had envisioned, and Pamela established a smooth transition between the spaces by facing the header and columns with Eldorado stacked ledge stone. The streamlined brown tweed Precedent sofa is backed with pillows in a colorful Romo floral and complemented by a clover back side chair, circular coffee table inlaid in a starburst pattern and a round caramel-colored area rug, textured in a fern design. For a surprising bit of glamor, she added a silver leaf log accent table from Phillips Collection. Tucked against a side wall of the breakfast area is a stone niche, counterbalancing the hearth room fireplace and furnished with a charming red secretary desk. Crisp in espresso and white, the country-chic casual dining ensemble is fitted with a Lazy Susan and lighted by a leaf-designed art glass chandelier from Global Views. In contrast to the rest of the home, Amy wanted a “more serene and elegant” décor for the vast two-story great room. Still, Pamela intended to keep the space functional, user-friendly and comfortable. Combining their objectives, they chose an overall palette of creams and beiges, accented with gold metallics. Upholstered in oatmeal-hued cut velvet, the curved Precedent sectional is well-suited to the scale of the room. 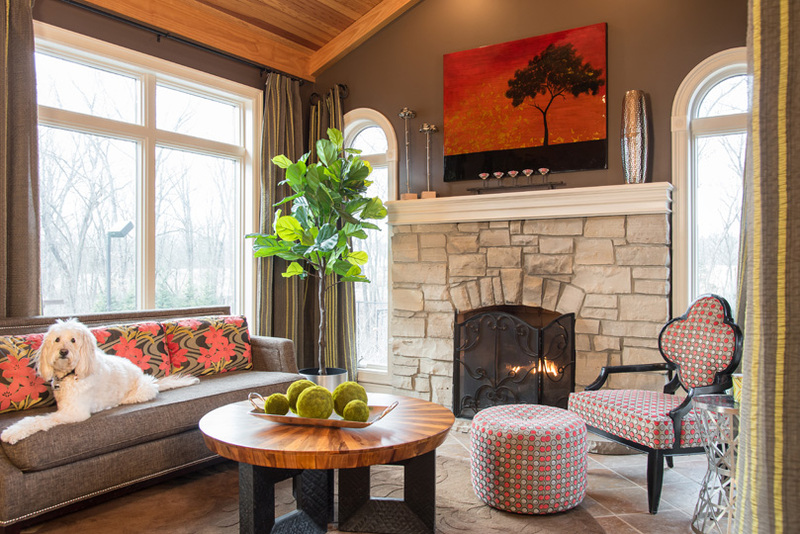 Decorative throw pillows lend a touch of fun and bling, and a unique, organically shaped coffee table, precast and finished in gold, is a reminder of the home’s natural setting. 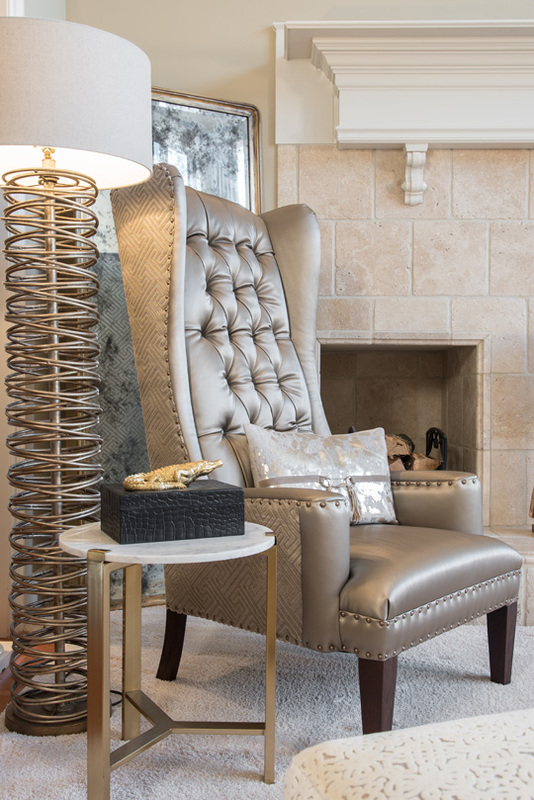 In a corner adjacent to the massive fireplace, the designer further demonstrated her ingenuity with an eye-catching vignette, positioning a metallic-sheen high-back chair against an antiqued mirror that reflects the chair’s patterned velvet back. It’s quite possible that Amy’s love of color may be hereditary, too. Allowed to design her own bedroom with Pamela, the Cooks’ youngest daughter chose a refreshing palette of aquamarine, lime green and soft grays. From the fluffy bed canopy to the cozy window seat, this blissful sanctuary would be the envy of any teenage girl. An artful blend of form, function and color, this spectacular residence proves what can be achieved when a gifted designer and creative homeowner share a vision and a convivial, like-minded working relationship.